It’s not uncommon for a family to have an exquisite piece of furniture that’s passed down from one generation to the next. Such cherished pieces are frequently custom made furniture that can’t be found anywhere else; they embody the family’s sensibilities and tell a unique story. Custom pieces are special because they’re designed and created strictly for you. They’re not generic. They’re not mass-produced. You won’t find another like yours anywhere. At R.E. Wampler & Son, custom furniture and cabinet makers in Bellbrook, OH, we create furnishings that can become part of your family’s history. Everyone who creates furniture and art wants it to outlive them. We try to create pieces that are both well-built and timeless. I’m Doug Wampler, second-generation owner of R.E. Wampler & Son, and this is our story. I joined my father in the family business after high school in 1976, and my interest in designing and creating custom made furniture and cabinets has continued to grow ever since. I enjoy the creativity and independence of making custom cabinets and furniture, and love interacting with our customers. Getting to know each client and understanding their likes and dislikes helps me create the perfect piece for them. One of my fondest projects was building this elaborate custom bar for a family who has become one of our best clients. 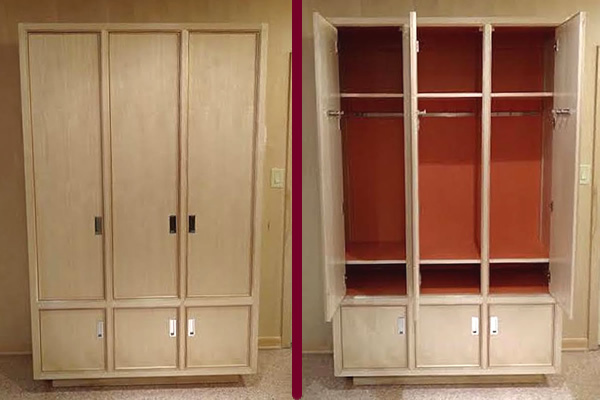 If you are considering custom made furniture or cabinets, here are some tips and suggestions. Take some time to consider how you plan to position and use your piece. Once we know that, we can design something that meets your every need. Together we’ll work out the exact size and all the drawer and door requirements. 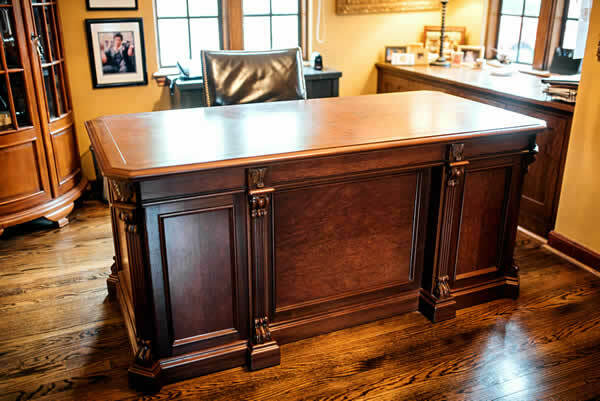 For example, we designed and built this ornate bubinga wood desk so it can be separated into three parts to fit through the door of its Oakwood owner’s office. We also designed it with clipped corners to provide better flow around the piece. In essence, we had to shrink it down to function in the small room without compromising the design or any of the details. Nobody knows you like you do, so consider your home’s aesthetic and remember that you have the option to choose every aspect of the piece. For instance, a New Bremen client had a specific African theme in mind when she asked us to craft the table seen here that she hopes to pass down to succeeding generations. We had to choose a flowing wood with a bold grain that would be traditional to the culture. 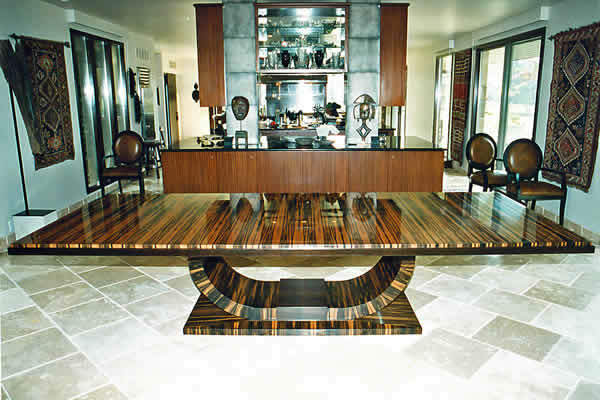 We selected Macassar ebony edged in gaboon ebony with a central support structure to create a floating effect. Whether you prefer a classic, whimsical, or bold style, we’ll help you incorporate your tastes and story into your custom furniture piece to give it meaning. You can choose the exact graining you want, decide on a unique pattern, or go with a subtler look. Whatever you’re seeing in your mind’s eye, we’ll work with you to make it a reality. An Oakwood couple had mixed tastes. The wife loves bright, vivid hues, while the husband prefers a more subdued look. The white birch mid-century modern cabinet we designed incorporates both of their desires. When you open the cabinet, you have that surprise pop of color. He got his neutral look, she got her orange. For a free, personalized consultation about your custom made furniture, cabinet, or shelving needs, call us at 937-848-9279, send an email to rewamplercc@gmail.com, or use our convenient online form.